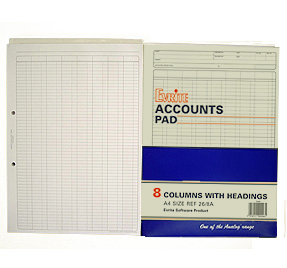 The 26/8A Analysis Pads were designed by accountants where they are used extensively in Administration and Accountancy Practices. With its high quality 80 gram paper (grey ruled) with dust cover and board back they are our most popular pad. Standard Hole punched for easy filing. Boxed in 20’s – NO Split Boxes for smaller QTY orders.